This new series offers Jeep owners three new LED upgrades: Dual Burn® headlights, smoked turn signals, and carbon fiber fog light kits, all with plug & play installation! Retrofitting LED headlights into certain motorcycle buckets can present a challenge for some motorcycles. J.W. Speaker is the first to solve this problem offering 18 easy-to-use fitment kits. Attempting to Break the World Record! To promote Motorcycle Safety Awareness Month, Brandon Yahr, employee of J.W. Speaker, attempted to break the world record for time spent circling a roundabout! A group of J.W. 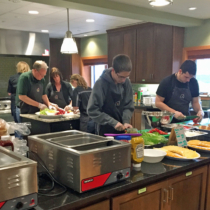 Speaker volunteers had the opportunity to prepare and serve a home-cooked meal to over 40 children and their families at the Ronald McDonald House, located in Wauwatosa, WI. We are happy to announce new sponsorships with Cora Jokinen, Levi Shirley and Jeep Jamboree for 2017! We will be taking these sponsorships and our full line of LED off-road lighting to new trails and racing events throughout the United States this year. Check out our Featured Vehicles this year at the SEMA Show 2016! Congratulations to our #SEMAwinningPix Photo Contest winner! Jordan will be receiving a Off-Road Jeep LED lighting package to update his 2000 Jeep Wrangler Sport. We can't wait to see how it turns out! Thank you to everyone who participated. This contest has now ended. J.W. Speaker is proud to announce the release of several new, LED lighting products this September. We have added a new 5.75" round headlight with turn signal, strobe light DIN pole mount, and off-road colored lenses.